BACKGROUND AND PURPOSE: Conventional X-ray angiography lacks the sensitivity and spatial resolution needed to detect small amounts of iodinated contrast material and to quantitate diameters of the small vessels in the brain. The purpose of this study was to ascertain whether digitized synchrotron radiation microangiography, with the use of a high-definition TV camera system, can accurately show small cerebral vessels. METHODS: Six anesthetized dogs were exposed to monochromatic synchrotron radiation with an energy level of 33.3 keV optimized for iodine detection while iodinated contrast material was injected into the brachiocephalic and vertebral arteries. The images were detected with a high-definition TV camera system with a spatial resolution of 30 μm. In all, 26 cerebral angiograms of the circle of Willis with its branches were obtained, and the images were digitized at a workstation. RESULTS: The small branches of the circle of Willis were clearly visible on all images. Vasodilatation of the circle of Willis and its large and small branches induced by CO2 inhalation was quantitatively confirmed on the images: for example, the diameter of one small branch was increased from 0.24 ± 0.04 mm to 0.38 ± 0.12 mm. Temporal subtraction improved the image quality. CONCLUSION: The synchrotron radiation angiographic system is useful for visualizing large and small vessels deep in the brain as well as for quantitating their diameters. It is known that small-vessel disease in the brain causes lacunar strokes and that some patients with lacunar strokes have a high rate of recurrence (21%) during a 3-year follow-up period (1) and of death (6% to 20%) due to stroke during a 3- to 5-year follow-up period (1–3). Therefore, clinical detection of small-vessel disease would be crucial for predicting a possibility of strokes and for avoiding risk factors for a life-threatening cerebral attack. Unfortunately, conventional imaging data are neither prognostic indicators in patients with lacunar strokes (2, 4) nor useful for evaluating liable small-vessel abnormalities, as conventional X-ray angiography has neither the sensitivity needed to detect small amounts of iodinated contrast material nor the spatial resolution to quantitate the diameters of small vessels in the brain. With the conventional system, small arteries, such as the anterior choroidal artery, cannot always be observed, and quantification of the diameters is not possible in vessels with a diameter of less than 300 μm (5). Recently, we developed a microangiographic system with high contrast resolution and high spatial resolution, using monochromatic synchrotron radiation as an X-ray source and a high-definition TV camera system as a detector (6). This system allowed depiction of small vessels of the heart (penetrating transmural artery), brain (small branches arising from the circle of Willis), and intestinal organs (vasa recta and their submucosal communications) and of small branches (down to the fifth order) of the pancreatic duct. The aim of this study was to improve this microangiographic system by applying digital processing so as to allow visualization of small vessels deep in the brain and objective measurement of their diameters. The actual diameter changes in large and small vessels around the circle of Willis induced by CO2 inhalation or partial occlusion of cerebral blood vessels were quantitated semiautomatically. The fundamental design of our synchrotron radiation angiographic system was reported previously (6) (Fig 1A). Briefly, monochromatic synchrotron radiation with an energy level of 33.3 keV was obtained from beamlines NE5 and BL-14 in the National Laboratory for High Energy Physics, Tsukuba, Japan (7, 8). The contrast images of the object together with the reference copper wire with a diameter of 130 μm were formed on a fluorescent screen (HR-mammno, Fuji Film, Tokyo), where a 20 × 20-mm area was scanned with 15 frames per second for 6 seconds by a high-definition TV camera with 1125 TV lines. This camera is an image pick-up tube with an amorphous selenium photoconductive target and is characterized by its internal amplification process, which uses the avalanche phenomenon in a photoconductive layer (9–11). Electron-hole charge-pairs produced in the amorphous selenium layer are multiplied 32 times by avalanche multiplication to produce the output-signal current (11). The lens-coupling efficiency is also of great importance in attaining a radiographic quantum-noise–limited system, as described in previous articles (6, 11). We set lenses with a small F number (0.65) and a small demagnification factor (1.6:1) between the fluorescent screen and the camera in order to reduce a secondary quantum sink (11). The images were stored as a digital image (1024 × 1024 pixels, 12 bits per pixel, in a frame memory or a digital audiotape [DAT]). The general system was controlled with a workstation (HP-9000, Hewlett-Packard). The spatial resolution limit of this system was 16 line pairs per millimeter (lp/mm) studied with a modulate-transfer-function chart (MICK type 14: 2.0–20.0 lp/mm, Germany). As for contrast resolution with a vascular phantom (Type 76–700, Nuclear Associates, New York, NY), the minimum size (0.5-mm diameter) vascular phantom with a minimum concentration of contrast material (2.5 mg/mL of iodine) was visible through an acrylic block with a 75-mm thickness. With the current system, the detection limit is 95, 60, and 52 μm for vessels in the canine heart (12), brain (see Results section), and intestinal organs (12), respectively. A, Schematic representation of the experimental set-up. DAT indicates digital audiotape; LAN, local area network; SR, synchrotron radiation. B, An example of the method used to measure vessel diameters. Radiographic image shows cerebral vessels and a reference copper wire with a diameter of 130 μm (arrowhead). The mean density profiles (thin lines) and the running averaged mean density profiles (thick lines) for the two measured vessels (a and b) and the two sites of the reference wire (c and d) are shown. The diameter is calculated on the basis of the distance between the edges, which are defined as the two half-maximum points of the profile (see Methods). Ordinate represents density; abscissa, distance (μm). The measured value of the reference wire is approximately 130 μm. This angiogram was made from figure 2. All animal experiments were performed in accordance with the Guidelines of Tokai University School of Medicine on Animal Use, which conform to the “Guide for the Care and Use of Laboratory Animals” (DHEW publication no. NIH 86–23, revised 1985, Offices of Science and Health Reports, DRR/NIH, Bethesda, MD). Six beagle dogs (8–11 kg) were used, from which 26 cerebral angiograms were obtained. All six dogs were anesthetized with subcutaneous morphine hydrochloride (3 mg/kg) and intravenous α-chloralose (80 mg/kg) and were intubated and artificially ventilated with air mixed with oxygen at 1 to 3 L/min, a single ventilation volume of 15 to 20 mL/kg, and a respiratory rate of 15 to 20 per minute using a Harvard respirator to maintain PaO2 at approximately 100 mm Hg, PaCO2 between 25 and 40 mm Hg, and pH between 7.35 and 7.45, as described previously (13). A 7F catheter was placed in the abdominal aorta via the right femoral artery to record the aortic pressure and to obtain arterial blood samples. Left-sided thoracotomy was performed at the fifth intercostal space. In three dogs, a 7F catheter with seven pores was placed at the brachiocephalic artery via the left femoral artery to inject contrast material. The external carotid artery was ligated proximally on both sides; the subclavian artery was also ligated bilaterally distal to the point at which the vertebral artery branches off. 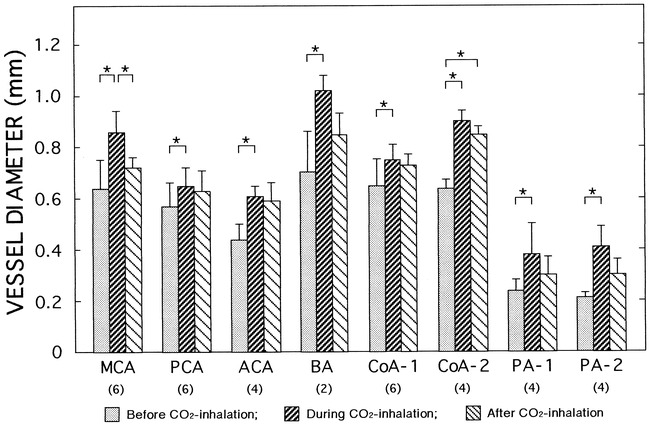 The contrast material injection was repeated during inhalation of CO2 (2 L/min without altering oxygen supply or ventilation) and 60 minutes after completion of the CO2 inhalation. In the remaining three dogs, angiography was carried out by injecting contrast material via the vertebral artery while the brachiocephalic artery was partially occluded. After thoracotomy, a silicon tube bypass equipped with the flow-probe of an electromagnetic flowmeter (MFV2100, Nihon Kohden, Japan) was set between the left femoral artery and the left vertebral artery. An adequate amount of heparin was administered (13). Thirty seconds before the contrast material injection, the brachiocephalic artery was partially occluded. This procedure increased left vertebral flow to approximately twice the preoccluded value. Under this condition, contrast material was injected via the left vertebral artery. Without this procedure, the circle of Willis and its branches cannot be seen entirely via the vertebral artery. In all dogs, contrast material with 30% nonionic iodine (iomeprol or iopamidol) was injected into the catheter (13 mL/s for 1 second) or the bypass (3 mL/s for 4 seconds) while the dogs were irradiated from the throat to the parietal direction in order to obtain a full image of the circle of Willis. The vessel diameter was measured semiautomatically on the digital image of a personal computer (Power Macintosh 8100/100AV, Apple Computer, Inc., Cupertino, CA) with ready-made freeware software (NIH image, version 1.60, National Institutes of Health, Bethesda, MD) with some modifications (details not shown). The image data stored in DAT were transmitted to the Macintosh via a local area network (Fig 1A). The method of diameter measurement was as follows: the transmitted image (1024 × 1024 pixels) was interpolated to the image with 2048 × 2048 pixels. A short temporary axis was delineated by hand at the vessel specified for measurement. The mean density profile perpendicular to the temporary axis was calculated (thin lines in insets in Fig 1B). To smooth the density profile, a running average with an appropriate window value (3 to 7 points) was obtained (thick lines in insets in Fig 1B). The vessel edges were defined as a pair of the two half-maximum points of the running averaged profile. The vessel diameter was calculated on the basis of the distance between the vessel edges. The pixel size was 9.77 × 9.77 μm, estimated from the visual field (20 mm/2048 pixels). Figure 1B shows an example of the diameter measurement; a pair of lines indicates the defined vessel edges. In the preliminary study, 37 vessel diameters were measured (52–667 μm) by two members of the research team working on this project (one a core member and the other a medical student). Linear regression analysis of the two measurements revealed a good linear correlation (r = .999, Sy.x = 6.36) with a nearly ideal regression line (y = 1.017x−1.07). The diameter of the reference copper wire (130 μm) was also measured at two points, and the values of 129.07 and 128.57 μm are shown in Figure 1B. In several images, temporal subtraction was introduced to improve the image quality further. The subtracted images were created from the images obtained immediately before and during contrast material injection with custom-made image processing software at the workstation. All numerical values obtained in the present study are expressed as means ± standard deviation (SD). We applied the unpaired t-test for comparison of the mean values of diameter and body weight between the two groups; that is, with and without partial occlusion of the brachiocephalic artery and an analysis of variance for repeated measures (ANOVA) to determine the significance of diameter, blood gas, and hemodynamic changes from baseline during and at completion of CO2 inhalation. Differences were considered significant at P < .05. A representative angiogram obtained by injecting contrast material into the brachiocephalic artery is shown in Figure 2. The circle of Willis, the middle and posterior cerebral arteries, the anterior cerebellar artery, the basilar artery, and other small vessels were well seen. Two small branches arising from the communicating artery were visible on all the angiograms on either the right or the left side in all 26 images (see Fig 2). In one dog, one of these two branches arose directly from the proximal portion of the middle cerebral artery. In terms of canine anatomy, these two branches would presumably be the thalamoperforating artery or the anterior choroidal artery. On some images, the anterior cerebral artery, the internal ethmoidal artery, and the internal ophthalmic artery were also well seen. On occasion, some of these vessels were not visible because of the limited visual field size and incomplete filling of contrast material (laterality caused by selective injection, animal posture or both) but not because of inadequate sensitivity or spatial resolution in the present system. The visualization rates for the branches shown in Figure 3 ranged from 66% to 100%. 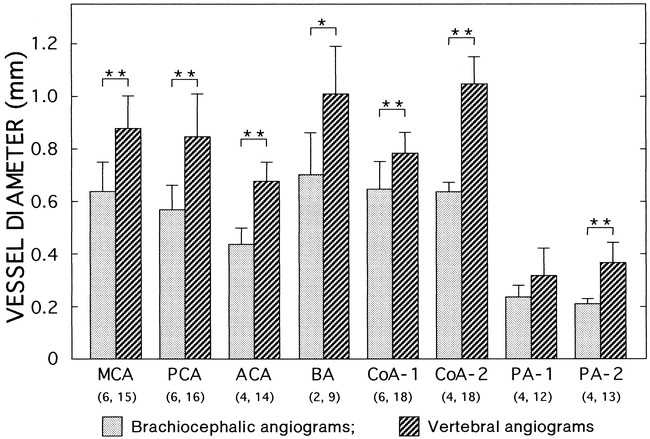 The diameters of the cerebral arterial branches, including the small arteries, were measured on both vertebral angiograms with partial occlusion of the brachiocephalic artery (nine images in three dogs) and on brachiocephalic angiograms without occlusion (three images in three dogs) (Fig 3). The diameters of the large branches ranged from 400 to 1200 μm; those of the small branches, from 190 to 510 μm (PA-1 and PA-2 in Fig 3). We compared the diameters of these vessels on the brachiocephalic angiograms with those on the vertebral angiograms in order to examine the effects of brachiocephalic occlusion (Fig 3). The diameters were significantly larger in the latter than in the former. Body weights did not differ significantly between the two groups (10.1 ± 0.4 kg vs 9.2 ± 1.0 kg). These results suggest that partial occlusion of the brachiocephalic artery caused vasodilatation of both large and small arteries. Vertebral angiography without brachiocephalic occlusion revealed only spinal branches, the circle of Willis not being visible (data not shown). The temporal digital subtraction technique improved angiographic quality by reducing the background. As an example, temporally subtracted images are shown in Figure 4. Figure 4A was created from Figure 2. The contrast of the angiographic image was increased and the vessels can be identified more clearly in Figure 4A than in the original images in Figure 2. 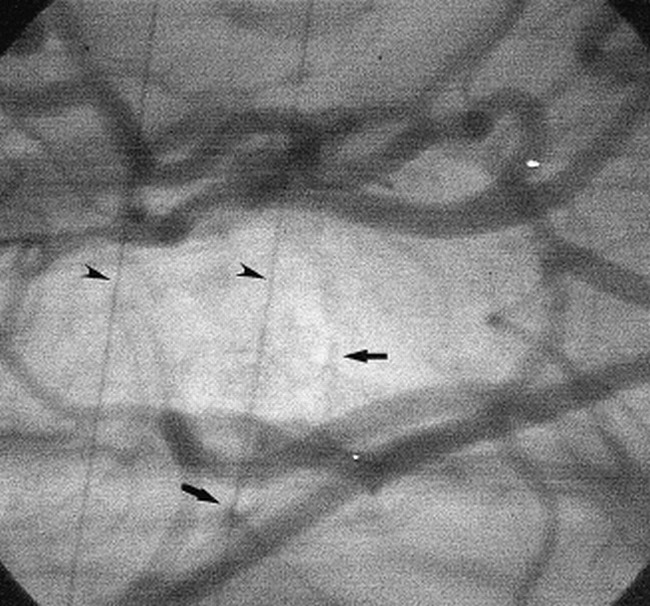 Temporal digital subtracted image of a cerebral angiogram obtained during CO2 inhalation. The digital image obtained immediately before injection of contrast material into the brachiocephalic artery was subtracted from that obtained during the injection. The field of view was 20 × 20 mm. A, Before CO2 inhalation. The original image is the same as that shown in figure 2. Arrowheads indicate large branches of the circle of Willis, namely, the middle cerebral artery, the posterior cerebral artery, the anterior cerebellar artery, and the basilar artery; arrows, small branches of the circle of Willis; double arrowheads, the internal carotid artery; double arrows, anastomotic ramus (between the internal carotid artery and the external ophthalmic artery). The anterior cerebellar artery arises from the communicating artery in the dog. PaCO2 was 34.9 mm Hg. B, During CO2 inhalation, PaCO2 was 125.5 mm Hg. C, 60 minutes after the completion of CO2 inhalation, PaCO2 was 30.2 mm Hg. Brachiocephalic angiograms revealed that inhalation of CO2 dilated both large and small arteries in all three dogs (Fig 4). These diameter changes are summarized in Figure 5, and blood gases and hemodynamic data in the Table. Representative subtracted images under CO2 inhalation are shown in Figure 4B. In all of the measured arteries, significant vasodilatation was noted during CO2 inhalation. Sixty minutes after completion of CO2 inhalation, the diameters of the vessels had not been fully restored to their baseline values (Figs 4C and 5), although the levels of arterial blood gases decreased toward baseline (see Table). Using monochromatic synchrotron radiation, a high-definition TV camera, and digital image processing with the present angiographic system allowed us to visualize small vessels deep in the brain as well as to evaluate their diameters quantitatively. Monochromatic synchrotron radiation made it possible to detect even small amounts of iodine and for the high-definition TV camera to delineate the images. The digital image processing enabled us to perform the diameter measurements with negligible interobserver differences and to improve the image quality. With the present system, the diameter of the smallest detected vessel was 60 μm (Fig 1B). We were able to visualize the small branches of the circle of Willis clearly and to measure their diameters (190 to 510 μm) on all angiograms with no significant interobserver differences. Our system has a pixel size of 9.77 × 9.77 μm and is capable of separating adjacent lead lines of 16 lp/mm on the X-ray modulate-transfer-function chart. Saeki and Rhoton (14) reported that the diameter of the human anterior choroidal artery is 0.5 to 2.3 mm. Generally, on conventional film-screen angiography, brain vessels with a diameter of less than 0.3 mm cannot be measured (5). Even with the use of a small X-ray focal spot (40 μm), brain vessels with a diameter of 0.2 mm still cannot be measured in rabbits and ferrets (15). Digital subtraction angiography with a 1024 matrix for clinical use has poorer spatial resolution than conventional film-screen angiography (16). The present system also allowed quantitative evaluation of vascular diameter changes with vasodilating interventions. During CO2 inhalation, significant vasodilatation was confirmed (Figs 4 and 5). Vasodilatation was also produced by partial occlusion of the brachiocephalic artery (Fig 3). Without brachiocephalic occlusion, contrast material injected into the left vertebral artery did not reach the circle of Willis. Another advantage of the present system is that measurements of the vessels' diameters were performed semiautomatically by the computer (Fig 1B). When vessel diameters were measured manually using micrometers, calculations had to be made by an investigator without knowledge of the purpose of the measurements (17). Our system has little measurement bias, however, as indicated by the results of regression analysis of the measurements done by two members of the research team (see Methods). In addition, the digitized image acquisition system allowed transfer of the images to personal computers without loss of spatial resolution. On a personal computer, various types of software are applied for quantitation of vessel diameters. The benefits of monochromatic synchrotron radiation and the high-definition TV camera have already been reported (6). Briefly, synchrotron radiation, which has an enormous number of photons, permits monochromatization at an energy level of 33.3 keV, enhancing sensitivity for the iodinated contrast material. The high-definition TV camera has high sensitivity and fine resolution. 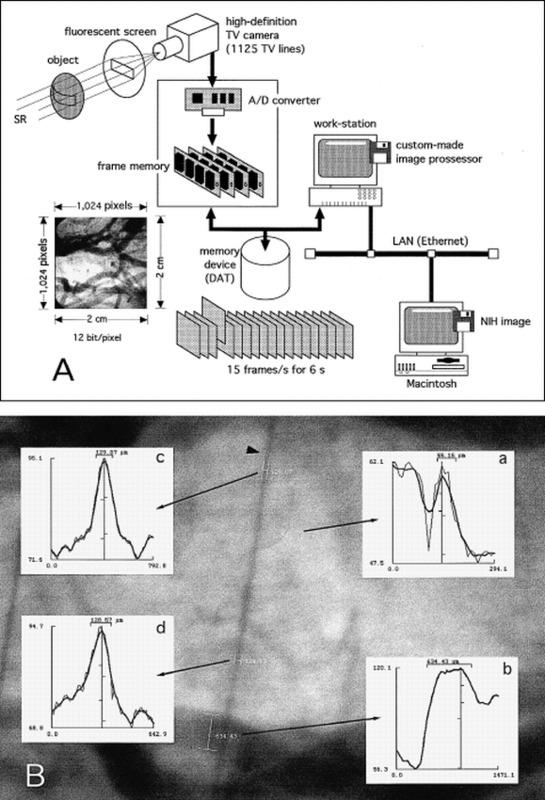 The present angiographic system has monochromatic synchrotron radiation, a high-definition TV camera, and digital image processing that is useful not only for visualizing small vessels deep in the brain but also for quantitating their diameters; the present system makes possible direct, minimally invasive evaluation of vasodilatation and vasospasm in both large and small vessels. Visualization and quantitation of the small branches of the circle of Willis suggest that the present system may be useful for identification of the small vascular segments related to small cerebral infarctions and transient ischemic attacks in humans. We thank Masami Ando and Osamu Shimomura (National Laboratory for High Energy Physics), Kenkichi Tanioka and Misao Kubota (NHK Science and Technical Research Laboratories), Hiroshi Kato (Eisai Co. Ltd.), and Tomoaki Miyazawa (Nihon Schering Co. Ltd.) for their valuable cooperation in this project and Yoshiro Iwata and Noriharu Yanagimachi for their useful comments. ↵1 Supported by Grants-in-Aid for Scientific Research (08877118, 09670756, and 10470171) from the Ministry of Education, Science, Sports and Culture of Japan, “Research for the Future” Program by the Japan Society for the Promotion of Science (JSPS-RFTF97I00201), Tokai University School of Medicine Project Research and Research Aid, and Eisai Pharmaceutical Co. Ltd. This project was approved as a Joint Research Program of the National Laboratory for High Energy Physics, Tsukuba, Japan (93G241, 95G113, 95G287 and 98G195). ↵2 Address reprint requests to Hidezo Mori, MD, Department of Physiology, Tokai University School of Medicine, Isehara 259–1193, Japan. Accepted after revision January 9, 1999.